Workflow Asset Management – or WAM – is a simple, accessible web-based programme that combines a bespoke inventory of your organisation’s assets with a maintenance scheduling tool to help ensure their optimum efficiency and so, in turn, excellent operational service. Your teams will easily be able to prioritise work and ensure each task is completed on time. You’ll have your own asset inventory interacting with a fault reporting and repair system and planned preventative task schedule. Do you have areas within your facilities that prevent you from accessing the internet on a mobile or wifi connection? 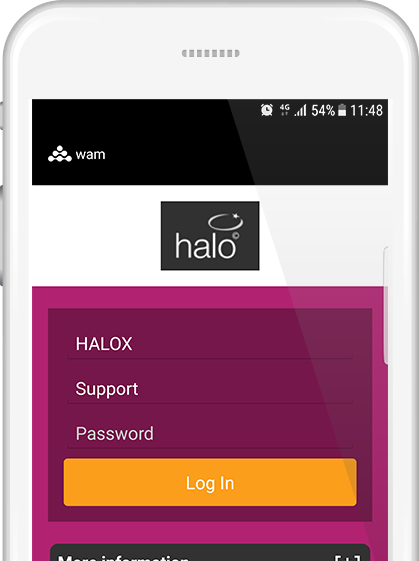 When you purchase WAM you will also be given access to the WAM app. This is a free download for tasks to be completed offline. Then, when your device can connect to the internet, it will automatically synchronise the information to ensure your facility data is as live as possible. Imagine walking up to a piece of equipment, scanning a code that is attached to the device using a mobile phone or tablet and then seeing all the relevant details about that piece of equipment. With WAM you can see any associated defects and planned maintenance that has taken place very quickly and simply. "WAM was credited as a significant factor in our excellent rating in our first QUEST inspection..."
"The WAM system is easy to operate and navigate even for staff who aren't used to computers. Gone are the days of sifting through months of paperbound maintenance schedules and reports." "WAM has proved excellent value for money. Within weeks we could see the backlog of tasks clearing. It is easy to use and its ongoing impact on our maintenance management has made a real difference to our customers." "We purchased WAM because we needed to manage our maintenance team and WAM was the most obvious choice. WAM has streamlined our business and our maintenance teams have become more productive. Why would I recommend WAM to a colleague? The ease of use, the user friendly screens and just an all round good system." "We needed a more robust method to identify all the assets across our facilities and a better way of monitoring the servicing of equipment, WAM seemed the most cost effective way forward to do this. WAM has allowed our organisation to modernise the way in which we recorded things across the facilities and enables us to have an accurate vision of where all our assets sit. It has also allowed me to monitor remotely what is happening on our sites with both assets, job statuses and some of the daily procedures that we have added to the system. I would recommend others to look at WAM as an option, it is simple to use once you have built the system you can allow access to others and give a better control on updates when contractors have visited the sites and allows you to better control the frequency of information that would otherwise be missed." "Aneurin Leisure bought into the WAM system following testimonials and recommendations from colleagues at Bridgend County Council on how it had changed the way they dealt with maintenance and asset management issues. Having used the WAM system for almost a year our colleagues in Bridgend were correct about how it would help to manage Maintenance. We have 3 Sports Centres, 2 Theatres a Country park and a listed house and park (With our Libraries and Learning Action Centres to follow sometime in the future) utilising the WAM system. The system has been extremely simple to operate form a Management and user point of view with some of my new Duty Managers being able to navigate the system with minimal training. WAM has changed the way we look at reporting and dealing with maintenance and the control it gives us has help us to be proactive as just being reactive. That said there are functions that WAM offers that we have not fully developed as yet but will find it complementary to our business. We would not only recommend WAM to our colleagues but have managed to get the Local Authorities Technical Services department to receive notification of WAM request thus improving response time considerably." "We decided to purchase WAM to improve the performance of our organisation and to help in our drive for excellence It has standardised all our paperwork and system in an interrogated way so we all work the same. It has helped the organisation progress and use a recognised industry system to help gain nationally recognised accreditation. (QUEST)"
"With our diverse property portfolio we needed a system that would help us more efficiently manage our assets. We needed a system that could be accessed and operated by a wide variety of staff, to help us coordinate all of our maintenance and repairs through a simple and user friendly system. WAM has provided a one stop shop for the logging and monitoring of work requests, the ability to track the condition and lifecycle of our assets and the scheduling of our planned preventive maintenance tasks. Surprisingly, WAM has lead to the more effective management of our health and safety responsibilities. The planned preventive maintenance schedule has enabled facility managers to schedule, record and monitor a vast number of daily, weekly and monthly checks that are so vitally important for the safe and efficient operation of our facilities. I would highly recommend WAM, whether your are implementing an asset management system for the first time or looking for more from your current system. WAM has been a real asset (no pun intended!) to our organisation and there are still elements of the system we are yet to fully utilise with new developments being added to the system on a regular basis." "We'd been looking for a system that could work across multiple sites and report back sensible information to managers so they could see what work has been done, and what is outstanding. When people work on shifts the paper based systems aren't always efficient. We'd tried an electronic system on one site but the roll out costs were horrendous. The flexibility of WAM was the attraction, but the price worked too. We are already seeing the difference. Everyone - from the site managers to the Board - are always up to date with work being done." "WAM has made a significant difference to our business. Instead of the Technical Manager dealing with numerous calls and emails, the team simply log a job on the system and it’s then assigned to the right person. Everyone, whether technical, facility or Head Office staff can log in at any time and get an update. We have opened the system up to other departments including marketing, who use it to log website issues, and finance who use it to log issues with our business management system." 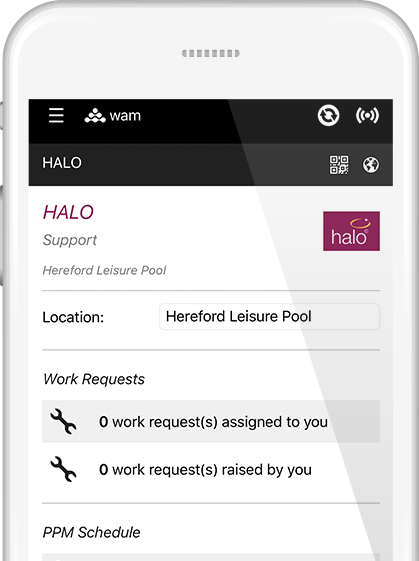 "We have been using WAM at our leisure centres for some years and monitoring the progress of allocated work, defects repairs etc. is much more efficient using this programme. The Planned Preventive Management module has proved hugely beneficial in cutting down on paperwork and the audit trail facility allows us to give hard evidence to the auditors regarding the resources required to run the maintenance department for the next financial year. WAM has also improved communication with our contractors. We can email work schedules directly to them so they are fully aware of what we expect of them." "The thing that surprised me was, being such a good system, why I hadn't heard about it before! The biggest difference is being able to organise, prioritise and keep track of all our maintenance and this difference was almost instant. I would be happy to recommend this product on to others. There is not a person I've shown who hasn't been impressed." "Hate to say it, but the biggest surprise about WAM was the price more than anything, closely followed by the speed with which it has made a difference. The biggest noticeable transformation was the ability to decide which centre requires priority and be able to take the right equipment with you. Saves a lot of time and allows us to centralise our tools and spares at the nearest centre to our homes. Would we be happy to recommend the product to others? We already have!"